Cellulose and fibreglass are two of the most common insulation products, and their popularity is due mostly to their being the most inexpensive and easy-to-install products available on the market. Tropical Insulation chooses to insulate with cellulose for a variety of reasons. Cellulose insulation is a grey fibrous insulation material manufactured from of up to 87% recycled paper products and is one of the most environmentally friendly types of insulation available. Compared to fibreglass, cellulose is produced from mostly locally-sourced recycled paper (newsprint) diverted from landfill lowering waste and its carbon off-gassing, reducing our overall global carbon footprint. 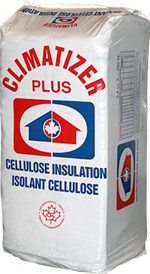 Tropical Insulation is proud to use Climatizer Plus™ cellulose insulation. Climatizer Plus™ is a loose-fill blown-in cellulose fibre insulation that is manufactured in Ontario, Canada by Climatizer Insulation. It has been certified by the Underwriter’s Laboratory (UL) ECOLOGO™ program and undergoes additional third-party laboratory testing as required by federal and provincial regulatory bodies. Since 1983, cellulose has been our insulation of choice, allowing a safe working environment for our installers and the best choice within its application range for our customers.